Fiesta San Antonio is our city’s most loved signature event. 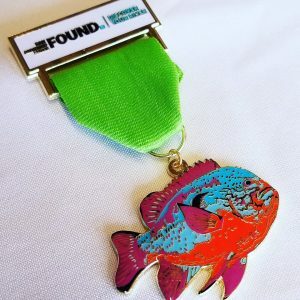 In celebration of this historical festival, the San Antonio River Foundation is delighted to share our 2019 Fiesta Medal. F.I.S.H. is the star of our 2019 Fiesta Medal! You can purchase a vibrant, miniature replica of our cherished F.I.S.H. sculpture that resides over the San Antonio River, while ‘commuting’ with their compadres under the I-35 overpass near the San Antonio Museum of Art. Each medal is $10 with proceeds benefiting events and experiences along our San Antonio River.